rec. Chiesa di S.Marta, Romano Canavese (TO), Italy, October 2014. DDD. Texts and translations and paintings by Artemisia Gentileschi included. This anthology of music lamenting the cruel treatment of women (literally ‘there is no compassion’) is not the first attempt to connect the life and work of the painter Artemisia Gentileschi with the music of her time: Dorian Sono Luminus released an album of vocal and instrumental music entitled What Artemisia Heard in 2015 (DSL92195 – review). By design or good fortune, only one item is common to both: Falconieri’s instrumental Folias echa para mi Señora Doña Tarolilla di Carallenos. The Sono Luminus collection featured three sopranos and a bass, whereas we have to ‘make do’ with just one soloist on Dynamic. When the soloist is of the calibre of Silvia Frigato, I’m not complaining. I’d forgotten that she joins Roberta Invernizzi on one of the Glossa recordings of Handel’s Italian compositions (Duetti e terzetti, GCD921517 – review). I’m not surprised, however, to see that I bracketed her with Invernizzi on that recording as ‘wonderful’. She impresses there and here without undue use of vibrato – though I’m less vigilant in condemning its use in the music of this period than my colleague Johan van Veen, I note that he found her singing the only stylistically satisfying vocal contribution in his review of Caldara’s Morte e sepoltura di Christo (GCD923403 – review). Not only is there only the one small overlap with the Sono Luminus recording, most of the items on the new release are otherwise unavailable. 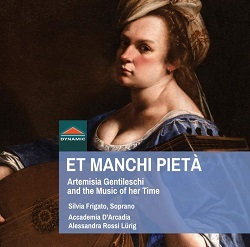 The two pieces by Barbara Strozzi, included here not just as representing a rare female composer of the time, but by merit of her music, are also to be found in a recent collection of Heroines of Love and Loss (BIS-SACD-2248 – review). I slipped that into a review of music for Passiontide and Easter, where it was all too easy for it to go unnoticed, so let me repeat that it’s a fine collection, including music by four women composers, and beautifully sung by Ruby Hughes, with fine support from Mime Yamahiro Brinkmann (cello) and Jonas Nordberg (theorbo/lute/archlute). Barbara Strozzi’s music is shamefully under-represented in the catalogue. A complete album of her Op.2 collection, entitled Passioni, Vizi e Virtue, certainly caught the fancy of Gary Higginson, who recommended buying it immediately (Stradivarius STR33948, download only). Having heard Peggy Belanger in L’Eraclito amoroso from that recording via Naxos Music Library, I can see what he meant. It’s more than a shame, however, that no digital booklet is provided for the streamed or download version of that album or, indeed, that I can find of the new Dynamic album. The booklet is provided with the Sono Luminus download and as streamed from Naxos Music Library; that actually contains more paintings than the Dynamic and includes the gruesome Judith slaying Holofernes, often regarded as the work of a woman to whom violence had been done by men getting it out of her system with a vengeance. Of the three available recordings of Strozzi’s L’Eraclito amoroso, that of Frigato on Dynamic is the most forthright; I’m tempted to make a horrible pun on her name and say that she sails through it, but that might imply a lack of emotion, which would not be true. Her voice may be the brightest in tone of the three and the tempo the fastest, but there’s no want of depth of feeling. The same is true of Lagrime mie. The opening Monteverdi Si dolce è il tormento can be found on several collections. Here again Frigato’s account is forthright but by no means lacking in feeling. I Fagiolini on a Monteverdi collection which I enjoyed sound a little slothful and under-nourished by comparison (Sweet Torment, Chandos CHAN0760 – review – DL Roundup July 2009). Honours are about even, however, with another recording which I like: Francesca Lombardi Mazzulli with Cantar Lontano gives a similarly bright but moving performance on Clorinda e Tancredi (Glossa GCD923512 – Spring 2018/2). My benchmark for Se i languidi miei sguardi is from Sara Mingardo with Concerto Italiano and Rinaldo Alessandrini (Monteverdi, Vivaldi and Handel, Naïve OP30395, download only – Recording of the Month). The combination of Mingardo and Alessandrini1 is pretty well unbeatable in this music, but Silvia Frigato, Alessandra Rossi Lürig and her instrumental team come very close indeed, which counts in my book as high praise. With unobtrusive but supportive accompaniment and direction, from an ensemble which I hadn’t heard before but would like to hear again, and good recording, the new Dynamic is worthy to stand alongside the other recordings mentioned. Even if you have one or more of the others, very little on the new recording will duplicate what you have and, in any case, the performances are sufficiently distinctive. Lovers of a pure soprano sound are very well served by Silvia Frigato, Alessandra Rossi Lürig and the Accademia d’Arcadia in this attractive collection. And you get the three Gentileschi paintings in the booklet – four including the cover self-portrait – though I repeat my protest that the streamed and downloaded versions don’t come with the booklet. 1 Alessandrini’s complete Monteverdi Madrigals Book VIII offers top-flight text-book performances of this wonderful collection; it’s scandalous that Naïve don’t offer the booklet with this now download-only set.